Do you know bean thread noodles? You should. Hopefully, after reading this blog post I can convince you to include bean threads more often into your healthy nutrition. 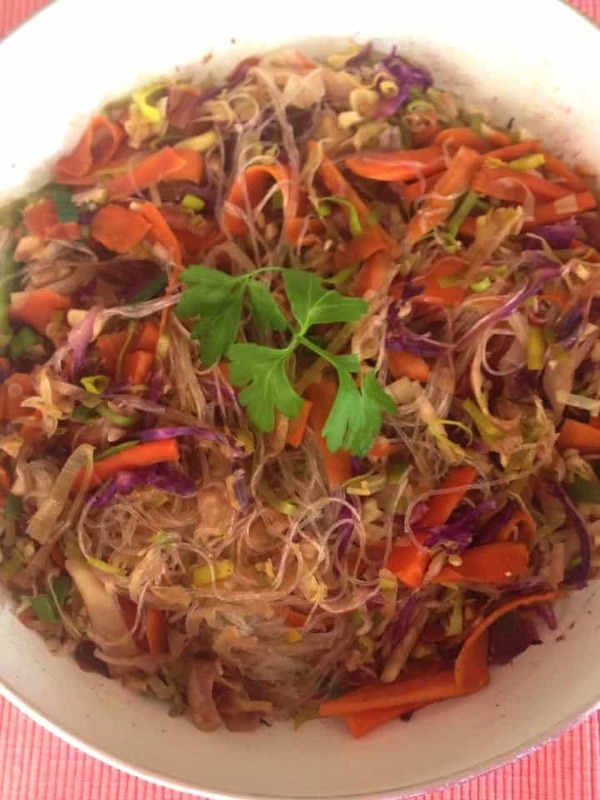 I’ll share with you also my favorite glass noodles recipe. 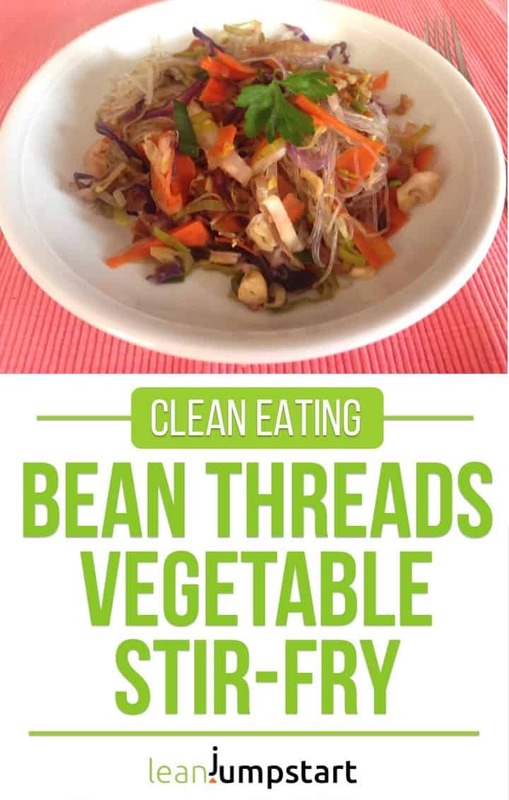 It is a Chinese vegetable stir-fry, which is the best clean eating meal I can cook if I have only a little time and a few veggie leftovers sitting in my pantry. What are bean thread noodles? Bean thread, glass or cellophane noodles are often needed for various, especially Chinese recipes. As the name suggests, they are transparent when cooked and thus similar to glass. In addition, they are razor-thin, so you can cook them very quickly. 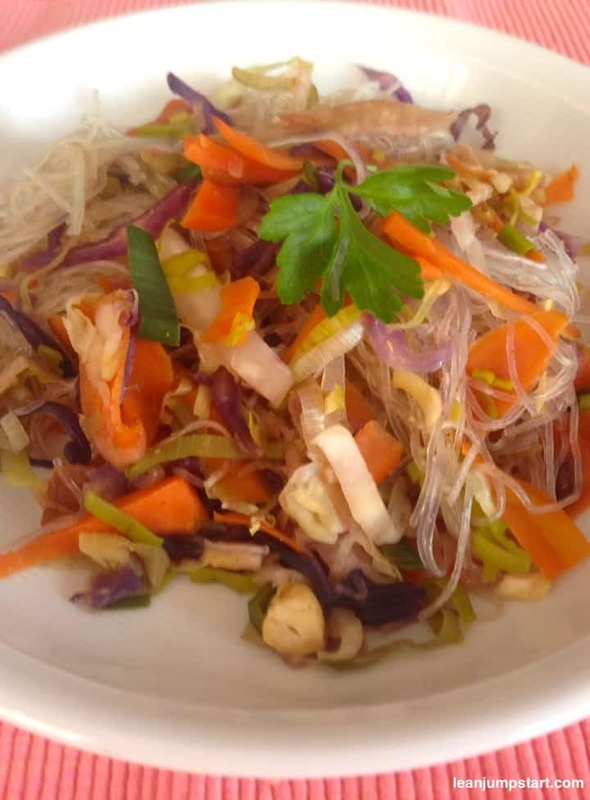 Glass noodles are made of starch from mung beans in combination with water. Sometimes, especially in Germany, you’ll find a blend of mung bean starch and green pea starch. Also known as mung bean noodles, mung bean vermicelli, or bean thread vermicelli, they are very rich in carbohydrates and free of gluten, fat, and protein. The translucent pasta itself is quite tasteless, but it is easily combined with other flavors. It has a springy texture, similar to an ‘al dente’ cooked wheat noodle. Unlike other types of noodles, mung bean threads are generally not boiled but soaked in water for 3-5 minutes and roasted or added directly to soups, salads or wok dishes. In some recipes, they are also raw fried or deep-fried. You might know them as part of a filling in spring rolls. It is advisable to break the pasta into shorter pieces, or cut it with a kitchen scissor, otherwise you will literally get “noodle salad” afterward. By the way, the pasta is easier to cut when already covered with water. To remove the excess starch drain well and rinse through with plenty of cold water. Hint: If you want to keep bean threads from sticking together toss them with a 1/2 teaspoon of oil. An example of soaked bean threads (after 3 minutes) you see on the picture below. Usually, Chinese, Thai or Korean glass noodles contain a large portion of gluten-free complex carbs that provide power and satiation. They are also a good source of the minerals selenium and iron (1). The starch in bean threads is called “resistant starch”, a fermentable insoluble fiber, which functions kind of like soluble fiber. It has the property to feed your friendly gut bacteria in the colon. (4) Fibers which can be fermented by the gut bacteria are also called prebiotics. Resistant starch actually improves our ability to tolerate glucose and increases insulin sensitivity while it doesn’t spike blood glucose. For many of my readers especially weight loss is their biggest struggle. If you need another staple that can help you with your weight management, I highly recommend cooking with this resistant starch-rich pasta more often. Heads up: I highly recommend to read the label before buying bean threads. There exist some types of Chinese glass noodles that are based on other starch sources (potato starch, sweet potato starch, rice starch etc.) that may not be as beneficial as mung bean starch. So if you ask “are glass noodles healthy?” my answer is: Yes if the above-mentioned health benefits are an issue for you. 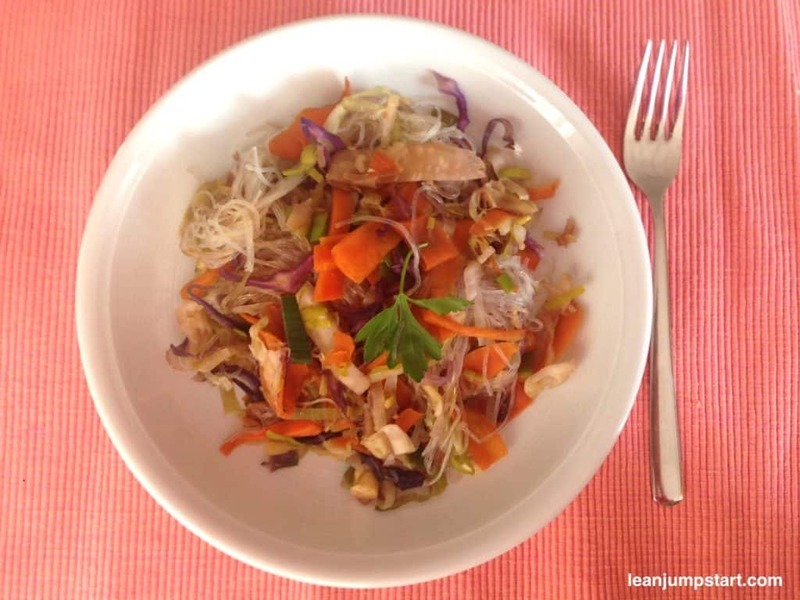 Let’s look in the following how to cook bean thread noodles for stir-fry. 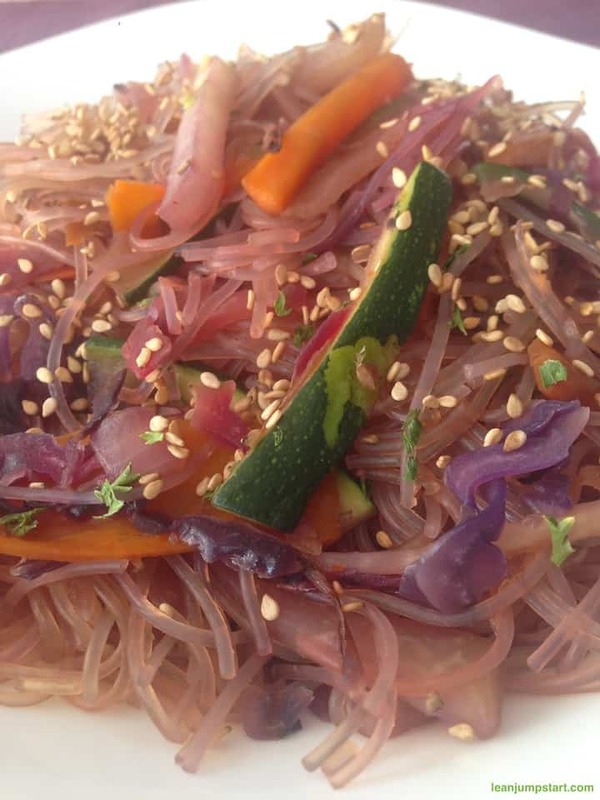 You will love this simple glass noodles recipe. It is ready in a few minutes and can be varied again and again. Regarding vegetables, you are very flexible because almost everything fits perfectly. Since I know, that red cabbage is the no. 1 bargain antioxidant food, I have it more often at home than my beloved white cabbage. As you can see it is a perfect match for this glass noodles stir-fry. Place noodles in a large bowl. Allow noodles soak in water for 3-5 minutes and then drain in a colander. Next fry leek and garlic in a wok or pan with some water or olive oil. Add the celery, carrots and red cabbage and fry for a few minutes. At last, add the soft glass noodles and season to taste with tamari sauce and lemon juice. If you want you can put some roasted sesame seeds on top. As mentioned before you can chop almost anything into this bean threads stir fry, especially (shitake) mushrooms are a great addition. When I don’t have celeriac bulbs I often use kohlrabi or sweet potato instead. On the picture below you see my recipe variation with kohlrabi, carrots, and zucchini. For a brighter color of the pasta leave out the red cabbage. At last, I’ve sprinkled some sesame seeds on top. Chopped tofu, chicken breast pieces, shrimp or fish sauce also harmonize very well with glass noodles. A very popular variation is to replace Tamari sauce with peanut butter which gives this dish a very distinctive taste. Another idea is to create a colorful bean thread salad with sugar snap peas and other veggies. Glass noodles are not only available in Asian markets, but also in specialized shops and larger supermarkets. Of course, you can get them online e.g at Amazon too. One of the recommended brands is “Longkou” or “Saifun”. Since no salt is used in the classic production process they have practically an unlimited shelf life as without salt they do not absorb any moisture. It’s important however to store the packed noodles in a dark, cool and dry place. 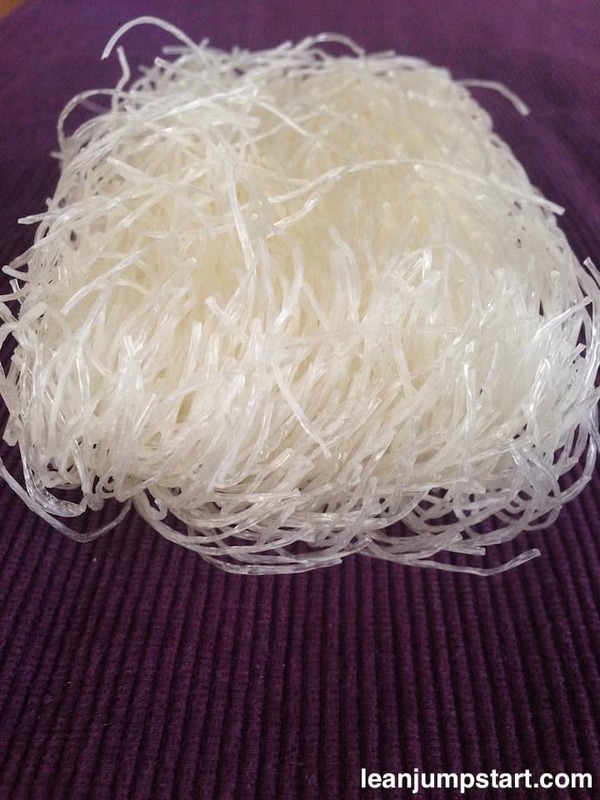 In contrast to glass noodles, cooked rice noodles are rather matt white and consist mainly of rice flour. Depending on the recipe, either cornstarch or tapioca flour is also added. Rice noodles have a more as double as high glycemic index than bean threads and are thus less beneficial for our system. I think I’ve never cooked with wood ear mushrooms so far, but I can imagine that they are a perfect match in this stir-fry. Thank you for your inspiration, Neriz. Wow, such an information-packed post. Thank you! I’ve always wanted to try making bean thread noodles at home (love ordering them when we’re out), so this is some excellent inspiration. Looks delicious! You are welcome Nancy and thank you:) This is funny, you seem to have more luck…whenever I’ve ordered Chinese noodles they were based on rice but I never got the original bean threads! I haven’t had bean thread noodles in forever! I used to stuff my lettuce wraps with them, but it sounds like they would be a fantastic base for so many other things. That stir fry sounds great! Thank you Jenni, also for inspiring me. You are right, they are a fantastic base and I should really also try lettuce wraps with them. In my opinion bean threads should be a staple in any kitchen with a busy schedule. Oh YUM! I have enjoyed bean thread noodles many times in restaurants but never thought to find them to make at home. I am excited to hunt some down and try this recipe. Thanks so much for the inspiration! Hey Christine, you are very welcome. Wishing you a happy hunting or you could buy bean threads in bulk online. I love bean noodles in salads!!! Never tried stir-fries though! I’m so glad I have another way to make it now! 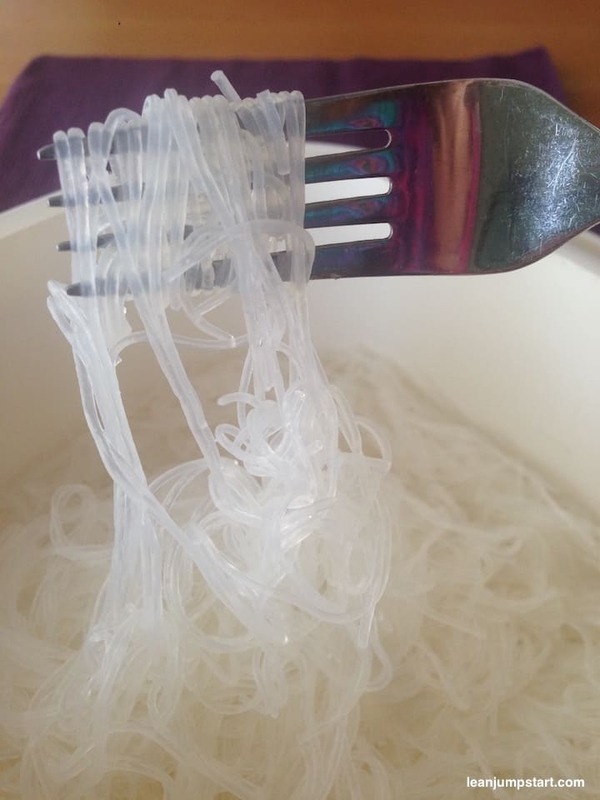 Wow, super informative post about bean thread noodles! 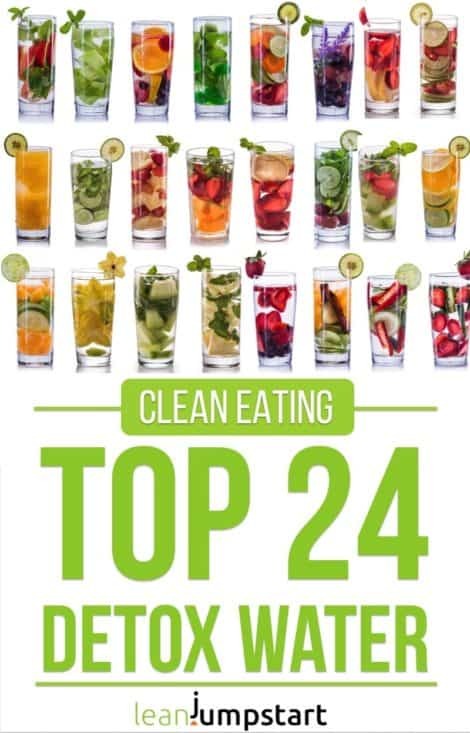 I didn’t know they went by so many names and I had no idea about the resistant starch! All good to know! This post was so helpful! I never knew what these noodles were actually made of, I just know I’ve had them out at a restaurant a few times and liked them. I can’t wait to try them at home now! I’m glad that my post was helpful for you and could inspire you to try these mung bean threads at home. Enjoy! Such an interesting recipe! I have never tried a thread noodle! This is my kind of salad! I love all of those veggies! Thank you Jo. You could try it on Amazon.in. I’ve just seen that they offer bean threads from the Saifun brand and some others. Good luck! I have never used bean thread noodles before! So interesting! give them a try and you won’t regret it – especially on those busy weeknights. I love the colors in this! Looks so tasty! This is my kind of comfort food. I love how many veggies you have managed to pack in to it. True, Dannii, I love to use a rainbow of vegetables – the more the better. Love how veggie-packed this dish is! Yum! I’ve never had bean thread noodles before and do they look good! Love your flavorings and I’m looking forward to making this. Great recipe, Gabi. We made it tonight after finding this post on Pinterest and it came out great!